Durable melamine surfaces are dent- and scratch-resistant. Drawers operate on full-extension ball bearing slides; file drawers accommodate letter and legal size files. Integrated 4-port USB hub. Convenient wire management. Three-quarter height modesty panel. Leveling glides help compensate for uneven flooring. 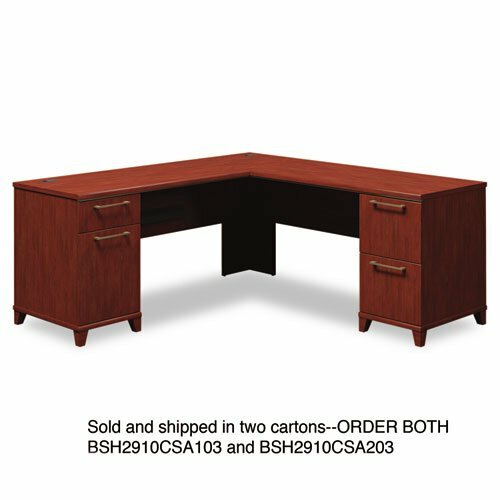 Color: Harvest Cherry; Pedestal Count: 2; Top Shape: L-Shape; Top Material: Melamine. Drawers operate on full-extension ball bearing slides; file drawers accommodate letter and legal size files.